Jennifer Rosato working with students in computer lab. The College is preparing Duluth-area high school teachers to introduce students to computing and its potential as a career, through readying regional teachers to teach two Advanced Placement (AP) courses: Computer Science Principles and Computer Science A.
St. Scholastica has developed and is offering graduate courses to six teachers in the summers and will provide ongoing mentoring during the academic year. The courses focus on computer science content and pedagogy specific to teaching underrepresented groups. After these courses are piloted at several designated high schools, the project will be extended to cover additional schools in Minnesota. No public high schools in northeastern Minnesota currently offer either of the two AP courses. In fact, Minnesota is among the least-prepared states with regard to teaching computing. Minnesota lacks a formal training and certification process for teachers in computing, and does not recognize computer science for core graduation credits. 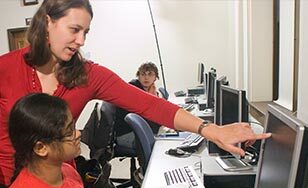 "In order to develop the next generation of technology professionals, we need to introduce them to the exciting variety of computing at the high school level," said Jennifer Rosato, an assistant professor of Computer Information Systems at the College. "This pilot project will prepare teachers to introduce students to computing and its potential as a career." The project is supported by the Duluth Superior Area Community Foundation.